We love water, be it in the form of lakes, ponds, rivers or waterfalls - of course we do love the sea as well, but its hardly to find any more in the Alpine area. Any more - because in former time there used to be plenty around, that is why you can get salt from the mountain. When talking about salt. 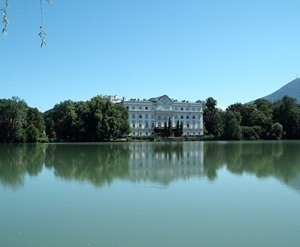 Let us talk about Salzburg (what can be translated as salt castle). And Salzburg owes its wealth to salt. The richness nowadays in Salzburg derives from: untouched nature, great landscape, amazing mountain views, great buildings and in winter all this covered in glittering snow. This is a great place to spend holidays and a great place to live. If the weather is not in summer time there is still plenty to do. Especially the city of Salzburg is highly frequent during rainy days: be it for shopping, sightseeing, walking around, visiting museum – you don't need 30degree to do so. Did you know that in summer there are sometimes so many visitors that there is a bad weather closure in Salzburg? If the weather is bad and there are too many cars in the city that cause hours (!) of traffic jam – only citizens of Salzburg are allowed to enter the city in car, all others have to leave their car outside the city gates in one of the "par an ride" parking spaces and can use public transportation to visit the city centre. Which in fact is far more comfortable than to drive by car and wait for hours to get a parking space in the city. The calendar sheet of August shows a place many people like to visit – especially those who have seen the movie "The Sound of Musik" with Fräulein Maria and the family von Trapp. The place which is shown as there home was in fact "Schloss Leopoldskron" the white castle which you can see in the picture, located at a niece pond. Ythe mountain in the background on the right hand side is called Gaisberg, on the left side you see part of Mönchsberg, one of the three mountains in the city of Salzburg – and of course you see the building that gave Salzburg its name, the castle Festung Hohensalzburg. If you like the view of castle Leopoldskron, I can recommend you another website, it is in German and bears lots of information on travelling to Salzburg and there are desktop wallpapers - one is showing the castle Leopoldskron and the hills which are alive with the sound of music.